Recently, numerous newspaper articles in BC have quoted Liberal MLAs issuing dire warnings that proportional representation is “bad” for rural BC. Cities will have too much power, they claim. Or rural seats will “disappear”. These statements are false, and no actual facts are offered to back up these assertions. These misleading attempts to pit rural BC voters against urban ones appears to be a strategy of opponents of fair voting. Let’s set the record straight: proportional representation is good for all voters, rural and urban. No matter where you live, or who you vote for, you deserve to help elect an MLA who shares your values. That’s the basic principle of proportional representation. First-past-the-post shuts voters out. Peace River North has been a Liberal seat since 1996. Who represents those who didn’t vote Liberal? Vancouver-Kingsway has been held by the NDP in every election except one since 1956. If you vote Liberal or Green in Vancouver-Kingsway, who represents you? As many people have observed, first-past-the-post can create a sense of futility for many voters. Almost half the voters in BC’s May 2017 election (49%) cast ballots which elected no-one. These votes were physically counted, but they did not really count. Contrast this with the 95% of voters in Sweden and New Zealand who were able cast votes that helped elect representatives to their legislatures. Proportional representation will give every BC voter – rural and urban – a voice. First-past-the-post masks the true political diversity of BC. As Andrew Kurjata points out, there are only three ridings out of 87 in BC where the winning candidate got 60% of the vote. Every riding and every region of BC is politically diverse. No matter where you live in BC, rural or urban, you are surrounded by neighbours who voted differently. Just as first-past-the-post can make it appear that almost everyone in Alberta votes Conservative in federal elections, first-past-the-post in BC can lead to a single party sweeping almost every seat in an urban area, and another party winning almost every seat in the the north or interior of BC, regardless of how many voters in those regions voted differently. As Chad Skelton points out, although half of BC voters outside of Metro Vancouver and Vancouver Island chose a party other than the BC Liberals, the BC Liberals won 83% of those seats. 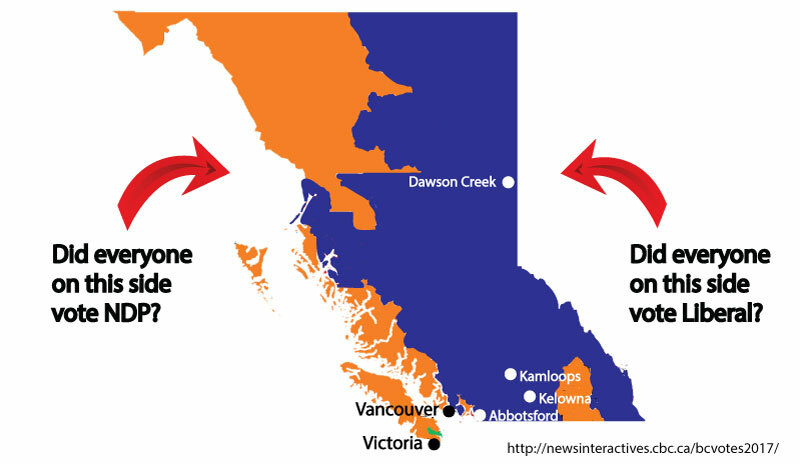 In Metro Vancouver and Vancouver Island, it was the opposite – the NDP won 63% of the seats with only 44% of the vote. This is where proportional representation comes in. Proportional representation doesn’t shift the balance of seats between urban and rural BC at all. Presently, some rural ridings contain fewer voters than urban ridings, giving the average rural voter a louder voice than urban voters. No one has indicated that would change under proportional representation. Instead, proportional representation gives every voter within every region a voice. PR ensures that results in every part of BC better reflect how people actually voted. Proportional representation works for rural voters, too. Let’s clear up some myths by looking at some of the benefits of proportional representation for rural voters. All models of proportional representation have strong local and regional representation. Voters will retain their local representatives and no seats will move to the cities. In fact, rural ridings will be able to amplify their voices because every vote will actually count! Every model will be tailored to the geography of each region, since no one size fits all, and riding boundaries will continue to be determined by community of interest, community of identity, historical patterns, and the need to keep the geographic size of ridings manageable. With PR, every voter is much more likely to have an MP responsive to the concerns of the voter and his/her community, whether due to party affiliation, roots in the community, or simply the MP’s willingness or ability to work to find solutions. Every voter will have a choice of MLAs to go to, including an MLA the voter helped elect. All regions will almost certainly have MLAs who are part of the government, rather than regions being shut out. In the past, we have all witnessed cheques being written for projects in ridings with government MLAs, while ridings with opposition MLAs are mostly ignored. With first-past-the-post, one party can sweep all the seats in a region, but if the MLAs are all in the opposition, voters in those ridings fear being ignored by the governing party. With proportional representation, every local area or region will have MLAs from more than one party. Competition and collaboration between MLAs is likely to mean more responsiveness to voters’ needs. Teamwork between MPs in a riding promotes good regional decision making, problem solving and governance for the benefit of everyone in the region. Proportional representation makes almost every vote count, no matter where you live. It means 30% of the vote will equal 30% of the seats – in your local region. Collectively, this produces fair overall results in the BC legislature, leading to cooperative governments representing a real majority of voters.